Because of their unsightly appearance and quick movements, many property owners are terrified of finding cockroaches in their home or office, and for good reason. These pesky insects can contaminate food and food prep areas, and they can cause respiratory problems in those with allergies and asthma. On the rare occasion, they may even bite. Thankfully, Palm Coast Pest Control is here to help you protect your family and your home from these troublesome pests. Contact our team today for a Speedy Fast Quote® for our cockroach control services! Are you concerned that you have a cockroach infestation in your Florida home? Spotting a cockroach in your home, dead or alive, is cause for concern. Where there is one, there is likely to be many. Aside from seeing these insects in your home, there are a few other indications that you may have an infestation on your hands, such as finding droppings and egg casings. You may also notice a musky, oily smell if your infestation is more advanced. Droppings may look like ground coffee or pepper, and are often concentrated in the corners of rooms, along baseboards, in food storage areas, and behind and underneath large appliances like refrigerators, ovens, washers, and dryers. Eggs are usually long, round, and brown in color, and they can typically be found in warm, damp areas of kitchens, bathrooms, and any other locations where you’ve seen signs of cockroach activity. 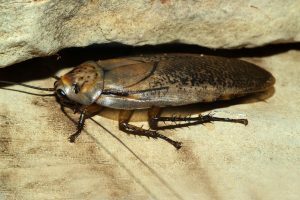 Florida is home to several species of cockroaches. The American cockroach, the German cockroach, the Asian cockroach, and the smoky brown cockroach are the most common. If you are concerned about the possibility of a cockroach infestation in your Florida home, time is of the essence. Palm Coast Pest Control provides effective residential and commercial cockroach exterminations services that will let you rest easy at night. Call our team at 800-819-7378 to speak with an experienced pest control expert or request your free estimate online now!